After a good rain, Eaton Wash Reservoir is a small lake. This is the reservoir looking eastward. On the far side a horse and rider are returning to the Eaton Dam Stables off of New York Drive. The reservoir was created in 1937 when the Eaton Wash Dam was built. It has a surface area of 54 acres. It does not take long for birds to find water. These are Canadian geese and ducks at the water's edge. Lots of honking and quacking going on down there. I've seen long-legged herons in this spot too. About every thirty or forty years, plans are made to commit Eaton Wash and Eaton Wash Reservoir for public parks and trails. In 1932, Los Angeles County produced plans for the Eaton Canyon Park, which included the reservoir area and the wash down to San Pasqual St. Then, a 1967 City of Pasadena plan called for a series of trails down the wash and a wild bird preserve at the reservoir. Now, after a forty year hiatus in planning for the reservoir and wash new plans are again emerging. In 2007, Pasadena adopted the Parks Master Plan which recommended trails along the Eaton Wash. Exciting work is also being done by students in Cal Poly's Urban and Regional Planning Program who are at the leading edge of plans to restore southern California's natural waterways and create a trail system. The Arroyo Seco Foundation has more on plans to create a "golden necklace" of interconnected trails using natural rivers and waterways such as the Eaton Wash.
Sunday we walked a stretch of Eaton Wash. This picture was taken just north of New York Drive. My first photo on this blog was of Eaton Wash taken from about the same spot in January 2008. Eaton Wash as it flows under New York Drive. This 1961 photo shows my grandfather standing in front of his house. On the right side of the photo is his solar water heater. If you look closely, you can see a water pipe entering the solar heater at its bottom left and the metal pipes behind the pane of glass. Grandpa bought the solar heater from a friend in the 1930’s and used it for some forty years after that. The solar heater saved him money, which was something grandpa was all for. Saving money (or more accurately avoiding ever spending it) was a way of life for him. He was frugal, lived simply and hated waste. It’s not like he made any considered decision about it. It was just part and parcel of who he was. He’s been gone for 20 years, but I still remember some of the things he did to save money. He had a metal tank welded on the back of his truck so he could load up when gas was cheap. He bought cases of canned goods and cereals when they went on sale. His house never had an air conditioner or heater – he used portable space heaters, if he used them at all. He saved and reused things like newspaper and tin foil. At his house you might find little sugars and jellies, like the ones they have at coffee shops. He kept records of everything. Every gas purchase was recorded in a little book he kept in his truck. Every household purchase was recorded. When he died my dad found receipts going back nearly 50 years. For my grandfather, frugality was a virtue and he was always on the lookout for waste. In fact, he would get mad over displays of wastefulness. Like I remember him getting angry about street lights that blazed at night. Why waste electricity burning street lights all night? As with many of his generation, my grandfather was primed for the frugal, resourceful life. The first 45 years of his life were lived during hard times. He was born at the turn of the century into a hardscrabble rural Iowa existence. World War I raged during his teen years. He married as the Great Depression started and then supported his family through the depression years and World War II. Even after times got better, he kept on with the austere life. It was all he knew and it was right. There was a resilient and scrappy quality to him. From what I know, he kind of pieced together a living and always had a couple of things going to make money. He worked in fruit packing plants, grocery stores and drove trucks. He also farmed. My dad recalls that when he was growing up, they had small family farm with chickens, cows, rabbits, pigs, fruit trees and vegetables. By the time I was around, grandpa was driving a school bus and tending a small grove of oranges and avocados. An early widower, he was known to spend weeks on end in the High Sierras, often taking his grandchildren. He had a shell on his Ford pick-up and a favorite spot in Reds Meadow along the San Joaquin River. He was camping and fishing for trout well into his 70’s. 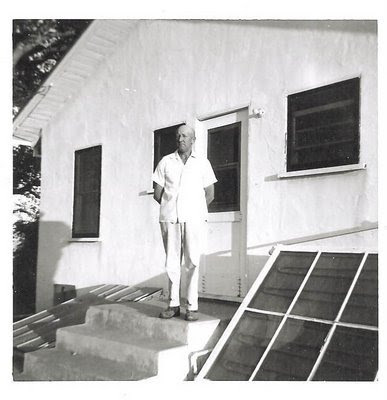 It was fun to come across this old photo of grandpa in front of his house with his solar water heater. I vaguely recall the solar heater. But I very clearly recall how cheap grandpa was. More and more, I find myself thinking about how he lived. I dearly hope to avoid the kind of hardships his generation lived through. At the same time, I can’t help but think that many of the resourceful, frugal qualities of my grandfather’s generation would serve us well today. Related to this, check out Pasadena PIO’s story on home solar power in Pasadena and a Pasadena DailyPhoto's picture of a bungalow with solar panels on the roof. And, I liked this story about a grandmother over at Hatching a Patch. Since posting on Earthside twice in December, I've made several trips back to the garden. The Earthside story continues to unfold and continues to fascinate. This was and is an incredibly beautiful place. And the time, effort and money that went into creating Earthside is evident nearly every step of the two acre site. Above is a weathered plaque that hangs on the outside of a kiosk at the entrance to Earthside commemorating its beginning in 1971. The faded photos provide only a glimpse of the work that must have gone into creating Earthside. A lot of people played a part in the Earthside story. Here's another weathered plaque that hangs outside the kiosk (donated by the Pasadena Rotary). The last honorees named on this plaque are Elna Bakker in 1994 and Virginia Connelly in 1995. Ms. Bakker was one of Eartshides' visionaries and her death in 1995 may have had something to do with the demise of the nature center. A few memorials are placed around the Earthside grounds. This one honors "Pop Pop" Shirley W. Owen of Pasadena. Makes you want to know about Pop Pop. The Earthside garden is on a hill adjacent to the EatonWash. This photo is taken looking west over the wash out to Eaton Blanche Park. Trails zig-zag down the hillside. Walking the Earthside site, you see the phenomenal amount of work and expense that went into creating this garden. The trails along the side of the hill are kept in place by an extensive network of rail road ties and heavy lumber. These stairs circle down the hill. The system of trails leads down to the edge of the wash, or more accurately, the fence along the wash. This rock lined pool is part of an oasis at the north west corner of Earthside. California native palms that stand over the pool. After the January rains, wildflowers are appearing. Life is evident in the dormant vines that line Earthside's north and west sides. I"ll return to see this garden grow over the coming months as the Earthside story continues.